Onward, Soldier. Onward In Love. This entry was posted in Poetry, Uncategorized and tagged Faith, Grief, Humanity, Inspiration, Life, Relationships on July 17, 2017 by Becky Benson. In the ten weeks following the two very risky emergency surgeries my dad underwent in August we’ve spent our weekends visiting him in the hospital where he remains, due to myriad complications, and is working on his recovery. He is being cared for in the hospice portion of the VA medical center, and while we are hopeful he can come home for his remaining time, the outlook is not certain. Each Friday after work and school both myself and my brother and our families drive the two hours to the VA to sit with him over the weekend. Each Sunday we return home for another week. It’s difficult being so far away, difficult seeing dad in there week after week, difficult on mom working, being there, and trying to keep everything running in the meantime. Of course, I’m no stranger to caring for an ailing family member. Our life with Miss Elliott taught us so much about the precious and fleeting nature of life and time. And even more about kindness, both what we’ve experienced from others and what we can provide. There’s a pizza place around the corner from the VA. We’ve taken to eating there on Friday nights. We walk over, place an order for carry out, and bring our food back to dad’s room so we can all have dinner together. This last Friday, as my sister in law and I were waiting in line, next up, deciding what to get for everyone a woman behind us asked if she could go ahead of us. We had decided, but were still holding our menus and she let us know she was just picking up an order. I said yes. It was no issue, really. A few more seconds waiting wouldn’t hurt. “Oh, I suppose. It wasn’t really a big deal though. I didn’t mind,” I told him. “It’s like she was saying ‘my time is more important than your time,'” he continued. “Maybe, but I’m really just practicing trying to extend grace where I can, so it was ok,” I replied. “Well, you’re nicer than me,” he admitted and walked away. It really got to me. What would I have gained had I denied her? It really didn’t interfere with my time. What if she was in a hurry? What if she wasn’t? Maybe she simply had bad manners, was impatient, or generally inconsiderate? It didn’t matter. None of it undid my act of extending a moment of grace to her through this tiny kindness. We should never regret the kindnesses we’ve extended to others, only the ones we didn’t. And why would this man have wasted the opportunity to act kindly? What would he have gained? Even if this woman was acting selfishly, does a kindness not counteract that selfishness? His unkindness would have only multiplied it. I think the issue at hand is the idea that two wrongs counteract each other. Isn’t that the problem with society today as a whole? Haven’t we stopped giving one of our loves away when we have two? I think we tend to greedily keep both for our self. Instead of just being thankful for one days’ portion we’re constantly looking to store up enough for tomorrow too. The problem here is that we get to a point where we feel we can never have enough, and in the midst of our search for more for tomorrow we forget to look out for who doesn’t even have enough to get through today. Maybe terminal illness helps you understand what’s really important, and conversely what’s not. I would argue that it does. It’s a hard way to learn those things, and luckily most people are blissfully ignorant to the difference in the two, but many of us were not afforded the luxury. Although, honestly, I think it’s another luxury in and of itself to know what it means go forth and try to spread goodness. 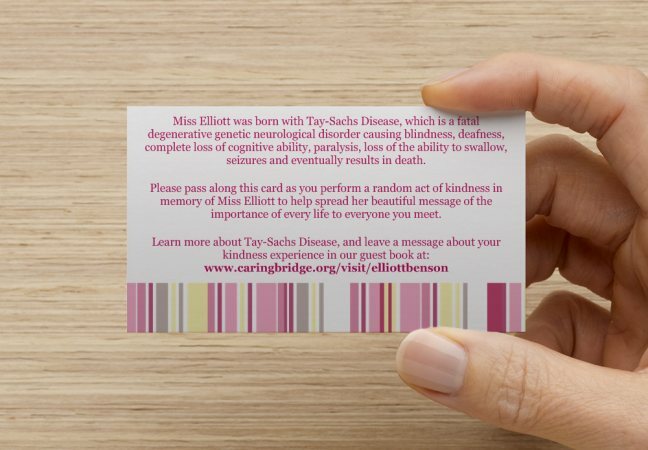 One of the ways I continue to honor our Miss Elliott’s life, and to spread Tay-Sachs awareness is to give out Random Act of Kindness cards. It just so happens that we had given some out, attached to some bags of candy for the nurses and family members in the hospice center that evening. I wished I could have given one to the man in the pizza place, but I’ll just have to hope my words to him about grace will have sufficed. I hope he carries them forward and finds a way to exercise extending grace to others too. This entry was posted in Life and tagged Grace, Humanity, Kindness, Life on October 17, 2016 by Becky Benson. Only twice in my life have I had such an experience. The kind that leaves you in unexplainable shock-even dismay, yet conversely strangely comforted at the same time. These experiences have left me questioning the theories of the known world, generally accepted as fact, and pondering the idea of what reality truly means. Is it relative to time and space? Is it relative even to your own individual perception? Can a broader more encompassing scope of the idea of reality even exist, or must it be accepted piece by piece, individually, as to only create an illusion of the idea of reality in each of us? I find that as time marches on, as I grow and learn, and as I mature the important answers in life seem to always be two steps ahead of wherever you currently are. To additionally compound the complexity of any given situation, I also tend to find those answers (whenever I’m lucky enough to get one) in hindsight, though I would have been sure they weren’t there before. Sometimes situations and experiences happen in which the explanation eludes you completely. And how then do we quantify the incident, but can chalk it up to nothing less than phenomena. Three years ago I stood at the instant-print machine in the photo department of a local store designing my Christmas cards. Tapping away at the screen a young boy, I’d say eight or ten, walked up to Miss Elliott and I. He stared at her quizzically for a moment and then directed his attention to me as he spoke. “She’s sick isn’t she,” he said. Caught off guard yet intrigued by his candor, “Yes she is,” I replied as I now looked quizzically back at him. “She’s going to die soon,” He continued. Shocked, I looked around. Who was this kid? Why was he here all alone? Where were his parents? “Yes, she is dying,” I confirmed to him. “She won’t be here for very long. She’ll make it through the holidays and past the New Year, but probably not long after that,” he prophesied. Tears formed in my stinging eyes. I wanted to ask him when, and how he knew this. I wanted him to reveal more information to me. Instead I stood there, paralyzed in some confused state of awe. Before I could say anything more his grandmother walked up. “I’m sorry,” she repeated, and they walked away before I could say any more. I wondered so many things. How could such a young child have had the foresight to think something like that? What prompted him to say it? Was he a messenger? And if so, did everyone in his life blindly excuse his differences as just nonsense? What made his grandmother think he was bothering me? Even more mysterious, I wondered if he even existed in the world at all outside of this particular interaction. Was it possible he was there solely to speak to me? I left the store more than a little rattled by my exchange with the Ghost of Christmas Future, and returned home. His prophecy now haunting my thoughts. She would die soon? When? Why? She was doing fine. I kissed her head and head her tight. I stared into her face and cried all night at the thought of losing her. It was, of course the nature of her condition. I had already acknowledged that she was, in fact dying. I just wasn’t ready for it. I knew I never would be. Christmas came and went, and so did New Year’s. By the end of January, when she was still with us I chalked the would-be prophet’s omen up to my own overindulged imagination and put it behind me, that is until February 3rd, when she passed away. As I sit here today I think about this experience so often, and know that even now, even in hindsight, I still can’t explain it. I’ve decided that this, like so many other things in life, I won’t have an answer to in this world, and I’m okay with that. Perhaps the answer isn’t what’s important. Perhaps it’s what I, what we all make of the experience itself. This entry was posted in Life and tagged Child Loss, Death, Grief, Holidays, Humanity, phenomena on December 8, 2014 by Becky Benson. October 3rd tends to swoop in and cover me in an eerily unusual calm. In the week leading up to it however, I’m a manic, grief stricken, emotional mess, inwardly. Outwardly I’m a mess that looks exactly like a person with perfectly manicured nails, expertly applied lipstick, and a perma-grin who goes around saying “I’m fine, really, but thank you for asking”. I find myself counting down the days until it’s over. Counting down the days until another of my deceased daughter’s birthday’s pass and I can get on with feeling the preemptive grief of Thanksgiving and Christmas, then New Year’s, then her death date. Then I get to swim along with eight blissful months of only my day to day grief, without some calendar specific date slapping me in the face. This year was harder. It was easier. I don’t know what it was. I just know I’m fine, and also, I hurt, all at the same time. It’s just another day, and it’s not. I tend to start compulsively baking, eating, making craft projects, and shopping for all of the aforementioned during this time. Anything to take my mind of my lonely longing heart. Sometimes the pain is multiplied when combined with fear. Fear that she’s no longer my child, in the active sense, but just a memory to those who knew her, and worse, only a story to those who didn’t. The thing you should know about grieving parents is that every time you want to tell family and friends about your child’s accomplishments, funny anecdotes of their behavior, or important memories you want to share, we do too. The problem is they’re physically gone, and you’ve most likely already heard everything we have to say. That’s one of the things that hurts me the most, I find. I want to talk about her. I want to tell about “the one time that…”, but there are no new stories share, no new pictures to show, nothing you haven’t heard before. So we talk in a loop, and keep bringing them up, not to make you sad or to make you feel badly about sharing your stories and pictures, but because we desperately want to be included, and don’t want our children to be forgotten. 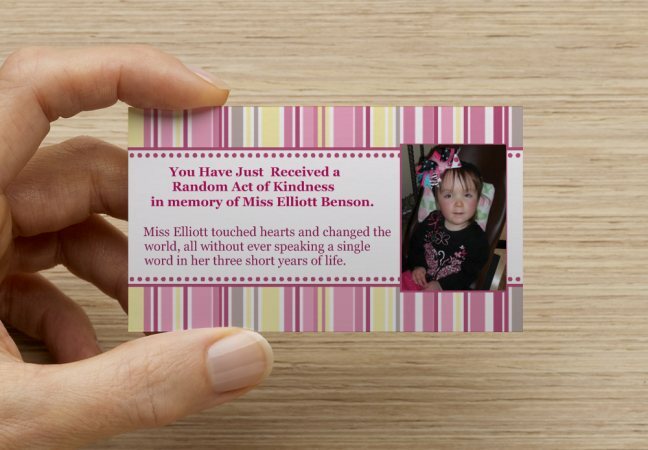 I firmly believe that the purpose of my Miss Elliott’s life was to spread the message that every life is valuable and important, no matter how short, and no matter how small. I also believe that her work can continue, and that we can all help spread this message. This year as her sixth birthday approached I decided to start a campaign I called “Six Years Six Acts for Miss Elliott”. I challenged everyone to spend the week leading up to her birthday committing one random act of kindness per day. I further challenged people to move outside of their comfort zone by not simply purchasing a latte at the local Starbucks, but by trying to spend little or no money a few of those days and to do something they might otherwise not. The point of the exercise wasn’t to make it easy, it was to have some actual forethought, combine it with resolve, and take action for good. Furthermore, I challenged individuals to reflect back at the end of the week to how their random acts of kindness affected not only the person they were kind to, but themselves as well. I took this challenge too, of course. And over the period of the next six days I found that on some days I used money for my kindnesses and some days I didn’t. Sometimes I spoke to the person/people and sometimes my kindnesses were anonymous. I also found that no matter what happened (even when certain stores refused to let me hand out my free kindnesses to customers, and I came home crying with Loren telling me her was sorry Corporate America ruined my attempt at changing the world), I gained something every time. When I woke up on the morning of October 3rd this year, I felt relieved. I was overwhelmed by pictures and messages of people telling me about their kindness experience. I was blanketed in comfort which served as my armor against grief that day. Instead of wallowing in my sadness over her absence I had made the day meaningful for not only myself, but others as well. I don’t know how much exponential impact these kindnesses had on the world, but I hope it gave people a reason to smile, and I know it gave my daughter’s name relevance. This entry was posted in Grief and tagged Grief, Humanity, Kindness, Life on October 11, 2014 by Becky Benson.